“I think that the prominence that land has played in the minds of people, before and now, is still basically the same,” Cal says. “The land has not lowered in its value any. If anything, it’s going up because the more people there, the more people are wanting—or are more protective of—their land. At the same time, you can sense that there hasn’t been very much of an effort in trying to cultivate it, like growing things more on it. But existing the back of the mind is the idea that the more land, the bigger the property a family or village has, the better off they will be. So the value of that is still the same, if it hasn’t gone up a little bit." “As long as it’s there for you, that’s the important thing. You can always go back and develop it as you need. You just sort of depend on it now for your day-to-day needs, as long as it provides for it. And when it doesn’t, then you go and put in a little bit more to provide for your increasing needs. It’s not like when you have to go in and build a big farm of, say, bananas because you put so many bananas in there to sustain you for whatever you needs are, and then if it becomes not enough, you expand it as it becomes necessary. 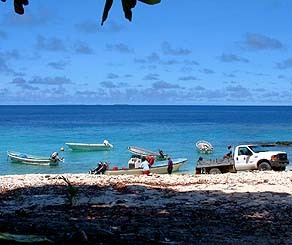 On Plane Day, boats and a truck crowd the launching area on Falalop. 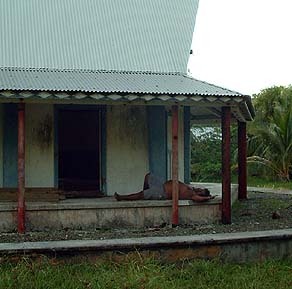 “Now we have boats, we have concrete houses, we have ice boxes, TV, which we didn’t have before,” Philip states. “We have airplanes, an airport terminal, we have concrete buildings for typhoon shelters and church, and dispensaries, and some of our kids have become Sisters and Priests. “Before, we had only thatched-roof houses made from local materials and sometimes when we had a typhoon, most of our houses were broken and we’d have to repair them. But a good thing about that also is that in the past when people were working together, we didn’t expect payment. 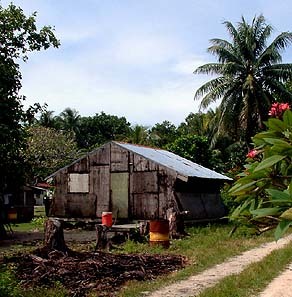 "For example, if my house was broken, everybody on the island would come and help me to build another house. If I needed a canoe, then people on this island would help me to build a canoe." 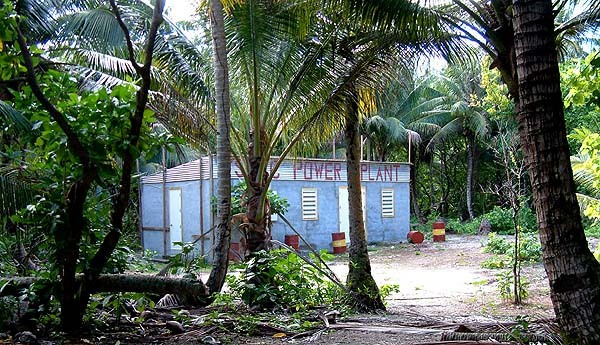 “At first, only the High School side of Falalop had electricity, because of the Coast Guard station. And then when they left and the government took this over for the school campus, they continued to have light on this side. And very recently they extended electricity to the families. On Mogmog, I think they have had electricity for only about one or two years. “Electricity has changed many things on Mogmog,” Philip remarks. “For example, now they have ice box, and I’m sure the people will not be as kind as before in sharing their fish and their food. They will keep the food to themselves and their family. On Mogmog, nobody will make loud noise, but today they play tape recorder and they show TV and people come and watch TV and learn more and more changes. “One very big influence on the culture here that I see is the television,” Isaac notes. “Because most of the things that people saw in the TV, they think it’s really true. So people start to imitate all those things and then they find it’s impossible to imitate it out here. So I think that’s one big influence to the culture here, because it influenced the young generation. And the young generation I’m talking about now, they’re maybe late 20’s or early 30’s. So since 20 years ago when television got out here, I think it has left a great impact on the culture." 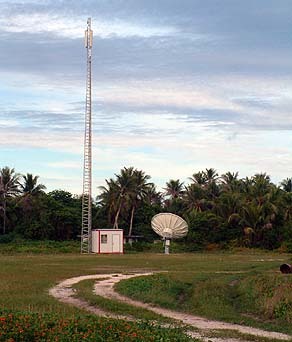 Communications equipment on Falalop. Outer Island High School now has high-speed internect connection. 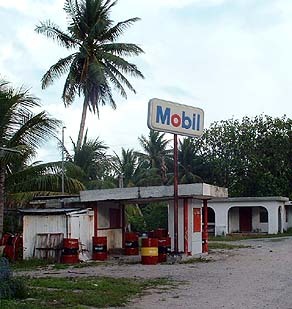 A gas station on Falalop. When you want gas, you find the owner, and he will pump it for you. “Airplane brings a lot of changes” Philip adds. “As soon as the people in Fais had airplane service, the Fais tobacco was not for barter any more, but for sale, for money. They sell it in YCA store in Yap. But you know what, the people of Gachpar, they get mad, because this tobacco belongs to them. “Now we have more concrete houses,” Pedrus points out, “but before we had only one that we used for the school, when the school started here. So now we have more, and there’s the school, there’s the dispensary, there’s the church. Then we have more concrete water catchments. 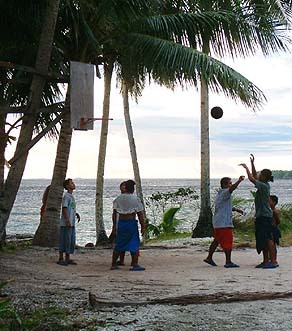 "Meanwhile, some of our people from here moved to work elsewhere within Ulithi Atoll. Some went to Yap, some went to Guam, some went to Hawai‘i. So now we have the same number of houses as before, but a few houses are vacant. "Even this Men’s House used to be more boys, but now that I’m not married, you’ll see only one man staying here during the night, that’s me. Pedrus demonstrates use of the Men's House. 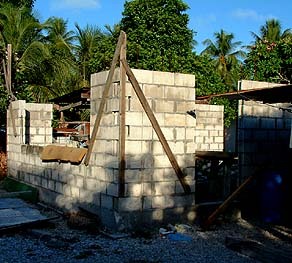 A new concrete and cinderblock house going up on Mogmog. “The housing has very much changed,” Stanley says. “You see the size of the homes we have now, well, my adopted mother happened to come back and look around this village, and said ‘Hey, what are you guys doing?’ This is unbelievable, the size homes we have. We are not supposed to have all this. We just had a little hut, enough for you to squeeze in. And if you have children, you just kind of extended it locally. "But now it’s all concrete and tin. And you don’t go and struggle over looking for local wood, because you have a job, you have the money, just order lumber. Just to have one very big home. So that’s a change." “Right after the typhoon in 1960, the government provided for housing material for every household on the island,” Isaac says. “So from local house, we went to wooden house, and then wooden with tin roof. That was a big change with that typhoon. "And came another typhoon in 1986, and the government also provided housing material. And then we started to get more and more tin roofs." A typhoon shelter house on Falalop. 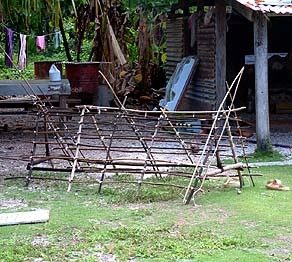 A model, miniature roof framework sits in a yard near the high school. "Now when you look around, the only local houses you can see are these cook houses and the koyeng? for, just to sit around and enjoy the breeze, is not sleeping house anymore." “More concrete coming up and less thatch,” Juanito agrees. “I still maintain two thatched houses, and I’m trying to keep these two for no reason at all, but just to keep them, especially so the young ones will see. Even though we cannot afford to buy concrete, we still can make our own. They have to learn to make their own houses. "The different islands are closer, more unified than before," Pedrus remarks. "Before, you didn’t travel to Mogmog and those people didn’t travel here for many weeks, even months. So when you saw each other you felt, ‘he’s from Mogmog, I’m from Asor….’ Or for some old friends, it was like a reunion. But now, you see everyone more often. You go to Mogmog, and you walk around the village, they come here they walk around to Falalop. Same thing on Fedraey too." 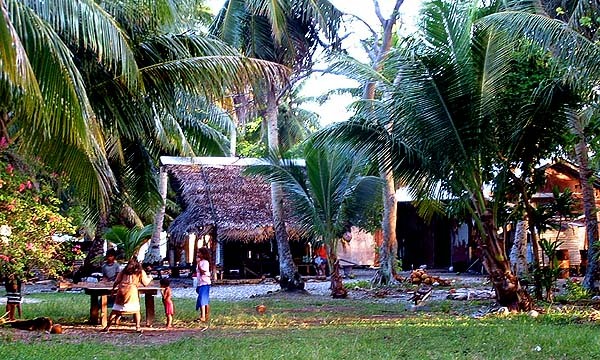 This stronger interconnection among the villages on the different islands is one factor affecting the new sense of community within Ulithi.